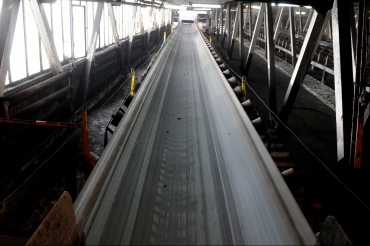 Fabric-rubber conveyor belts, multi-ply, oil resistant, oil resistant and non-inflammable as well as oil heat resistant, are designed for the transportation of loose materials containing oils of organic or mineral origin. Depending on the temperature of transferred material and locally occurring hazards, oil resistant belts, resistant additionally to elevated temperatures up to 100°C or 150°C or non-inflammable can be produced. The belts are made of polyamide-polyester (EP) or polyamide – polyamide (PP) fabric plies combined with a special rubber core and rubber covers characterised by increased resistance to oils or/and temperature. * Fields marked with a red asterisk are mandatory fields to be filled in, other fields of the form represent optional information.